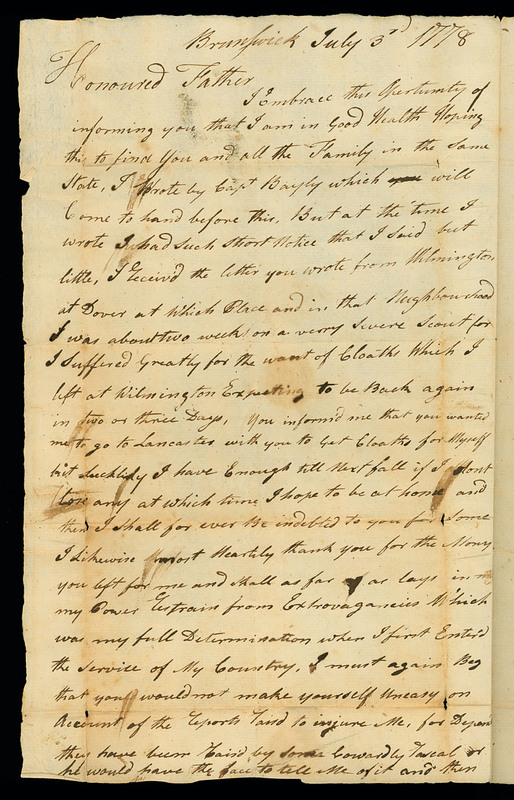 Abstract: Five manuscript personal letters written in 1777-78 by William Beatty, Jr., an officer in the Maryland Line of Continental Troops. Preferred Citation: William Beatty, Jr. Letters, Department of Special Collections, Hesburgh Libraries of Notre Dame. 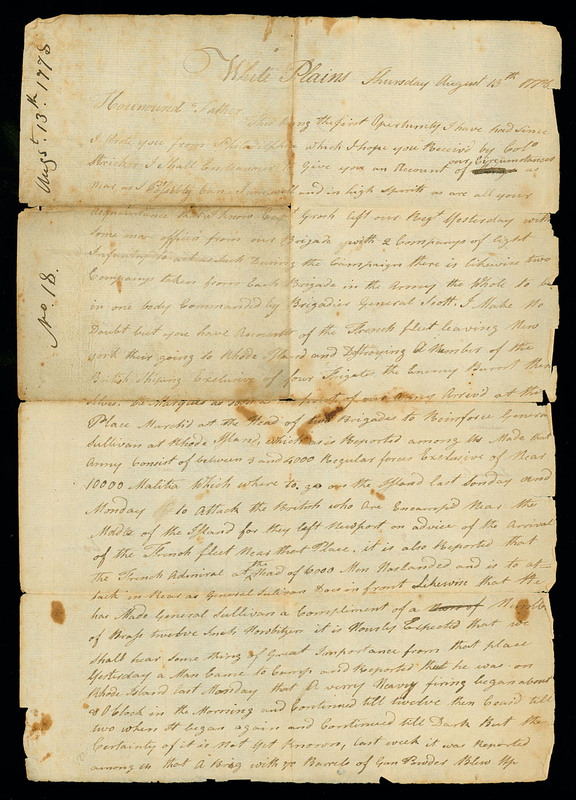 Acquisition and Processing Note: The Beatty letters were purchased by the Hesburgh Libraries of Notre Dame from Early American History Auctions, Inc., of Rancho Santa Fe, California (auction of 7 December 2002, lot nos. 267, 270-273). Arranged and described 2003, by George Rugg. Finding aid 2009, by Jacob Baska. William Beatty, Jr. was born on 18 June 1758 in Frederick County, Maryland, the son of Col. William Beatty (1739-1803) and Mary Grosh (1739-1810). The elder Beatty fought in the French and Indian War, and served as sheriff and colonel of militia in his native county. 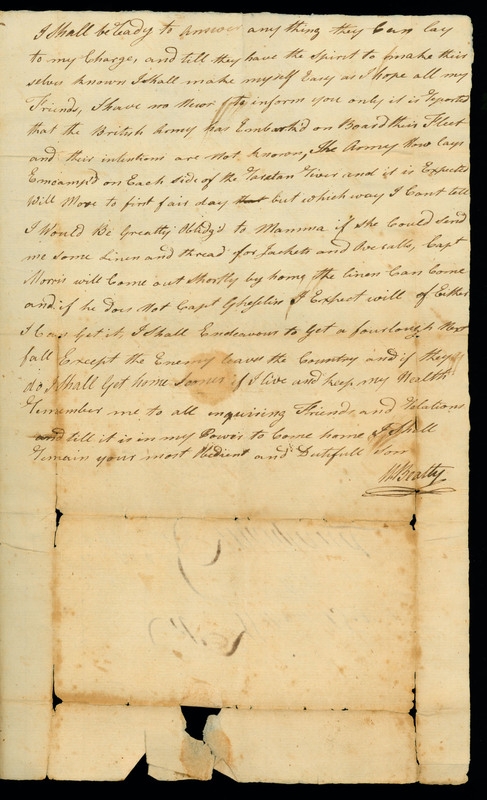 William Beatty, Jr. began his military service as ensign in a regiment of Maryland militia (June 1776); he was present at the evacuation of New York City in October. In January 1777 he was commissioned 1st lieutenant in the Maryland Line of Continental Troops, and spent the ensuing months raising recruits for the regiment (the 1st Maryland). He returned north in the spring of 1777, and fought at the battles of Staten Island (22 August), Brandywine (11 September) and Germantown (4 October), where he received a slight wound in the leg. Beatty remained with the Maryland Division of the Continental Army, at Wilmington, Delaware, during the winter of 1777-1778. The following year he fought at Monmouth, and was promoted captain (September 1778). In the war's Southern theater, Beatty remained with the 1st Maryland until his death at the battle of Hobkirk's Hill (25 April 1781). While leading his men toward the British line, Beatty was shot in the head and killed. He was unmarried at the time of his death. The collection consists of five personal letters written by William Beatty, Jr. to his father between 17 August 1777 and 15 September 1778. Beatty strives to keep his father informed of his health, needs and movements; he also describes war-related events, some personally witnessed. The collection is arranged chronologically, one item per folder. Several repositories hold manuscript material of immediate relevance to William Beatty, Jr. 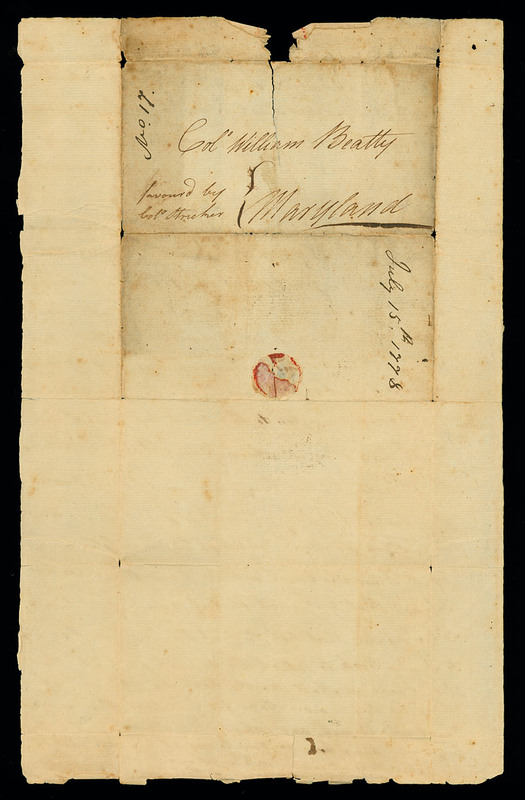 The Maryland Historical Society in Baltimore owns his military journal (1776-1781), as well as additional wartime letters. 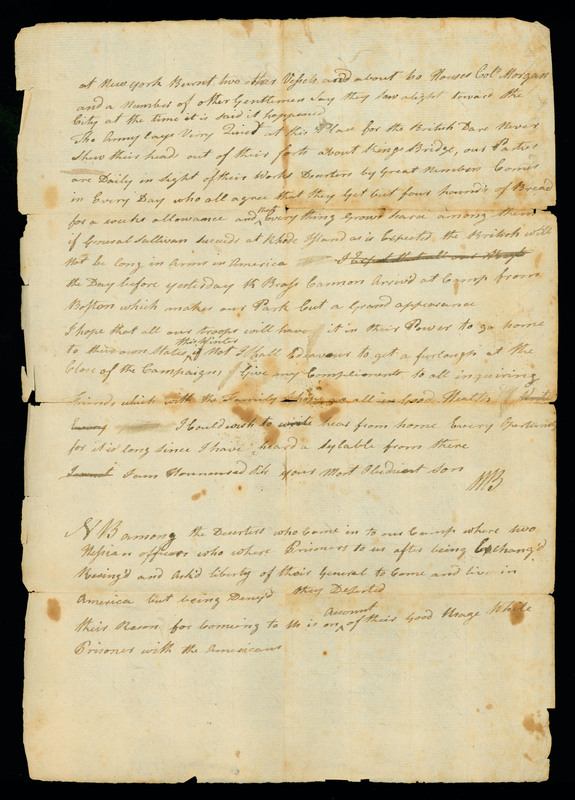 The Historical Society of Frederick County (Frederick, Maryland) has a collection of Beatty family papers that includes material from the time of the Revolutionary War. Eleven other Beatty letters were sold at the 2002 auction at which the Notre Dame items were acquired; only one of these can be located, at the John D. Rockefeller, Jr. Library (Williamsburg, Virginia). Letter. 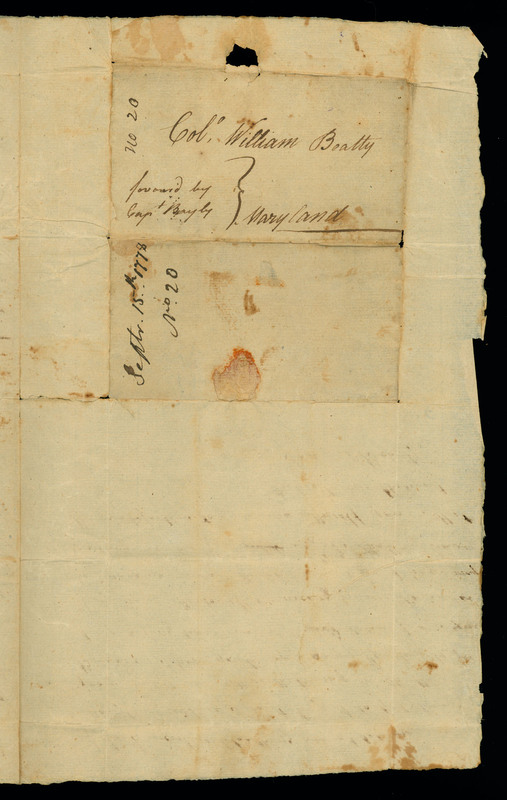 W[illiam] B[eatty, Jr.], Hanover, New Jersey, to Col. W[illia]m Beatty, Maryland, 1777 August 17. Folder 1 (MSN/COL 8500-01). ALS, 1 page (34 x 21 cm.) on 1 sheet, w/ address on verso. Docketing on verso: "No. 8. ", with notes on a brown mare. Beatty informs his father of his health, and discusses his material needs. 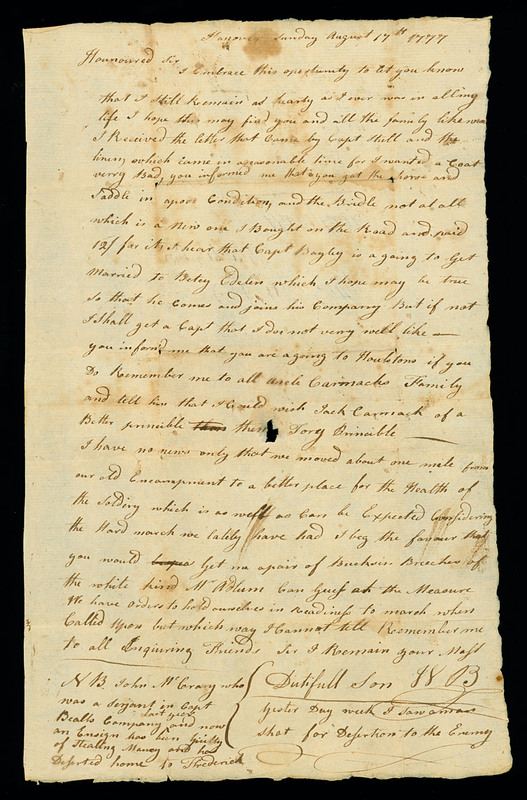 As for the military situation, "I have no news only that we moved about a mile from our old Encampment. . . ." In a postscript, mentions the desertion of one man and the execution for desertion of another. Letter. 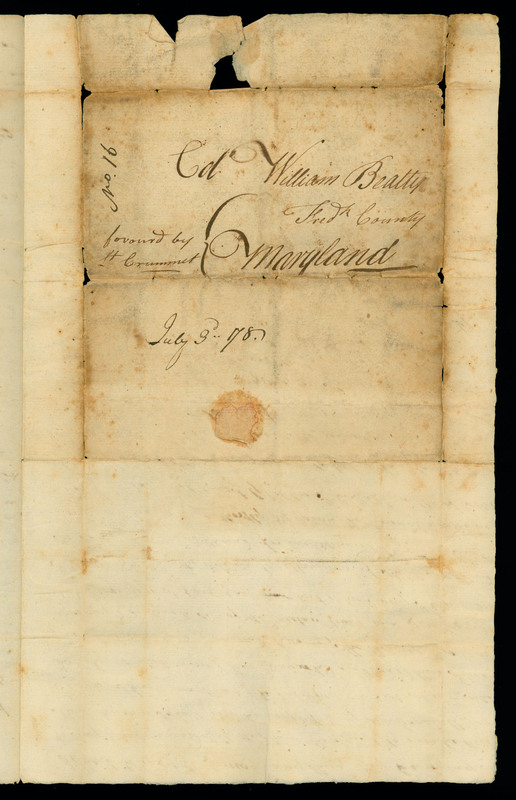 W[illiam] Beatty [Jr.], Brunswick, New Jersey, to Col. William Beatty, Fred[eric]k County, Maryland, 1778 July 3. Folder 2 (MSN/COL 8500-02). ALS, 2 pages (34 x 21 cm.) on 1 folded sheet, w/integral address leaf. Docketing on address leaf: "No. 16". Updates on Beatty's health and other matters. Beatty thanks his father for monies received and promises to "Restrain from Extrovagancies." He also requests that his father pay no heed to "Reports Raisd to injure Me" by "some Cowardly Rascal," but provides no further details. Closes with news on British activities in the New York City area. Letter. 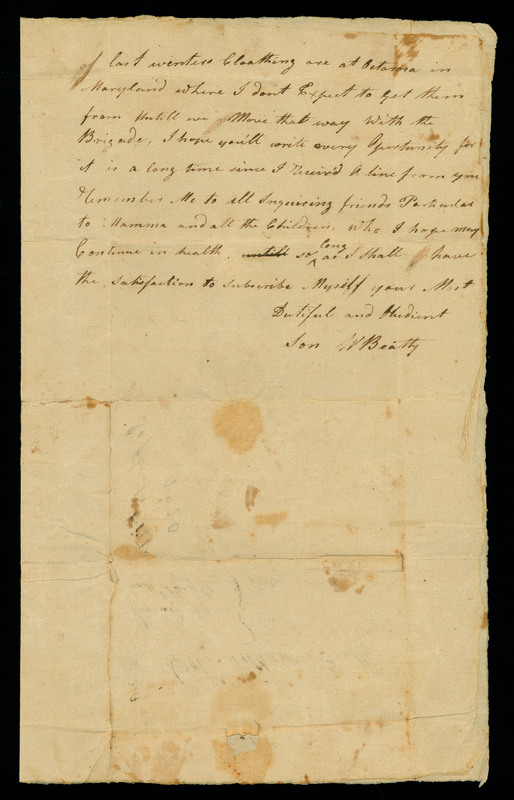 W[illiam] B[eatty, Jr.], Philadelphia, Pennsylvania, to Col. William Beatty, Maryland, 1778 July 15. Folder 3 (MSN/COL 8500-03). ALS, 1 page (34 x 21 cm.) on 1 sheet, w/address on verso. Docketing on verso: "No. 17.". Beatty communicates his need for summer stockings and reports that he recently traveled to Cecil County, Maryland to retrieve baggage belonging to the officers. He also describes seeing a French frigate leading several captured British ships. Opines that he will soon come home because "there is no Doubt of a french war which I Expect will put a stop to our troubles." Letter. W[illiam] B[eatty, Jr.], White Plains, New York, to "Hounoured Father" [Col. William Beatty], n. p., 1778 August 13. Folder 4 (MSN/COL 8500-04). ALS, 2 pages (34 x 24 cm.) on 1 sheet. Docketing on recto: "No. 18.". 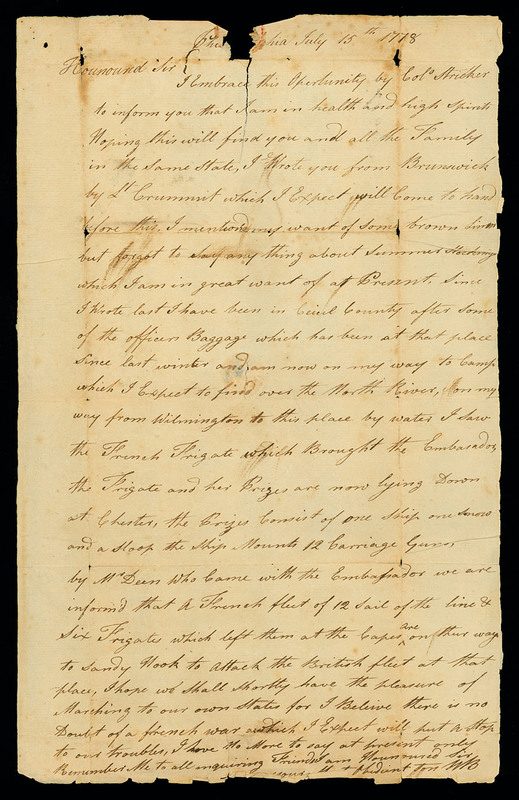 A letter largely dedicated to recent military events. Of particular note is Beatty's recapitulation of the joint action between the French and General Sullivan in Rhode Island. Also mentions that the British have "Deserters of Great Numbers" including two Hessian officers who had been American prisoners, were exchanged back to the British, but then deserted "on Account of their Good Usage While Prisoners with the Americans." Letter. 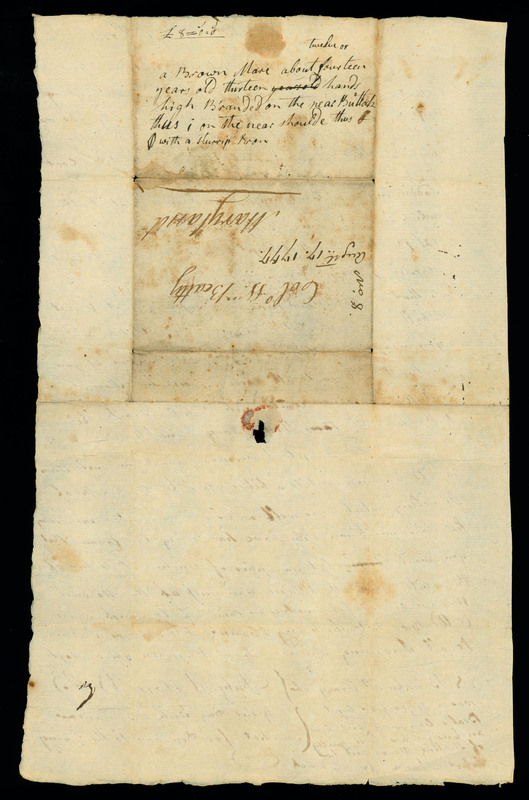 W[illiam] Beatty [Jr.], White Plains, to Col. William Beatty, Maryland, 1778 September 15. Folder 5 (MSN/COL 8500-05). ALS, 2 pages (31 x 19 cm.) on 1 folded sheet, w/integral address leaf. Docketing on address leaf: "No. 20". Beatty reports that, according to deserters, ". 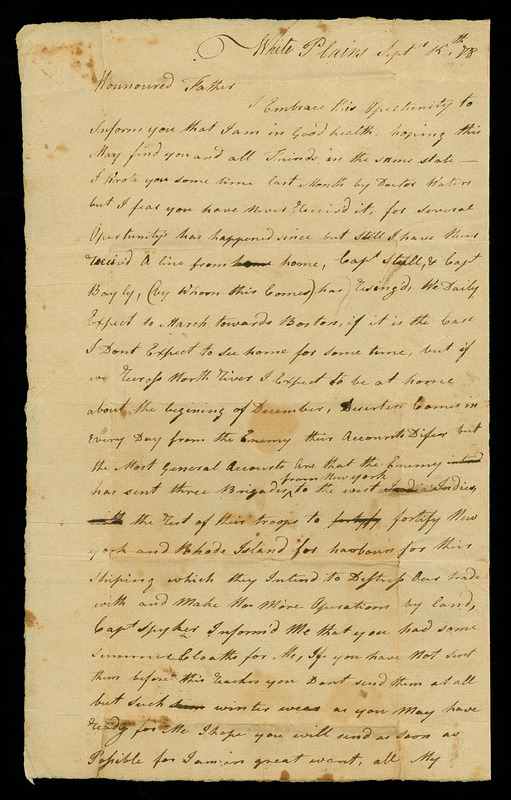 . . the Enemy has sent three Brigades from New York to the west Indies, the rest of their troops to fortify New york and Rhode Island for harbours for their shiping which they Intend to Destroy Our Trade with and Make no More Operations by land . . . ." Also asks for winter clothes "as soon as Possible for I am in great want."